This November, alongside a highly contentious presidential race, Californians will vote on 154 state and federal legislative races and 17 state propositions. One of the most consequential of these is Proposition 64, the so-called “Adult Use of Marijuana Act.” Despite its innocuous name, California Family Council joins numerous local, state, and federal organizations in strongly urging you to vote NO on 64. The Colorado District Attorney for the Second Judicial District recently wrote a scathing letter criticizing Colorado’s legalization of recreational marijuana and urging California voters NOT to enact a similar law with Proposition 64. These are all specific statistics from Colorado backing up what California Family Council has been saying on the harms of Proposition 64. California Family Council has written previously written articles detailing how Marijuana Negatively Affects Teens and Children, explaining that Marijuana Leads to Soaring Crime Rates and is Unsafe for California’s Roadways, and that overall, Proposition 64: An Unhealthy Choice for California. California voters are also being told that legalizing recreational marijuana will free up law enforcement to work on other criminal activities. Again that has not been the case in Denver. Besides the overall increases in crime we have experience[d], the Denver police department is dealing with a 900% increase in the unlawful cultivation and manufacture of marijuana concentrate, and a 99% increase in the unlawful distribution of marijuana and marijuana concentrate. The quantity of illegal marijuana seized by the Denver police has increased 3,424% on average per case. The volume of marijuana seized per case has increased from an average of 162 pounds to 5724 pounds. In Denver unlawful public consumption of marijuana citations has increased over 300% per year since the legalization of recreational marijuana. The Denver police department is busier enforcing marijuana laws and investigating crimes directly related to marijuana including murders, robberies, and home invasions than any other time in the history of the city. 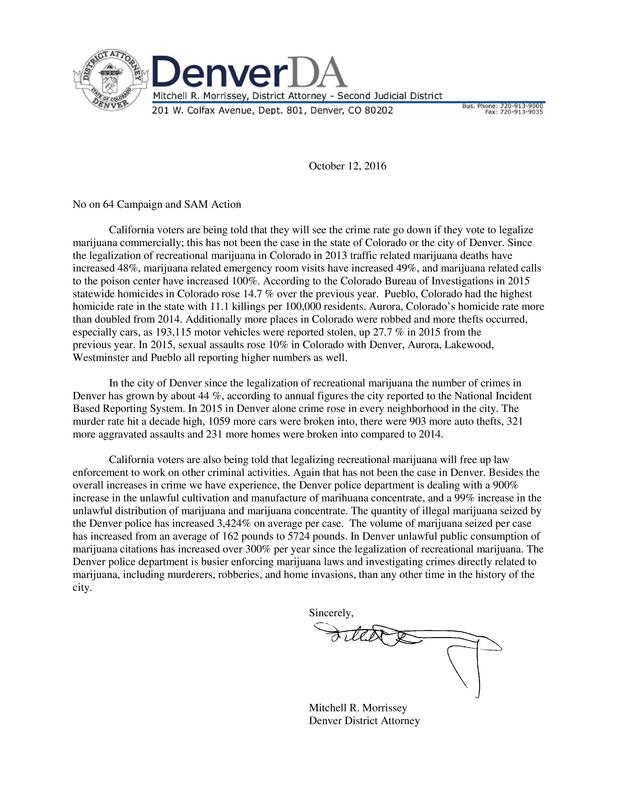 California Family Council is thankful for the thoughtfulness and concern that the Denver District Attorney has demonstrated in warning the people of California on the dangers of legalizing marijuana based on the experiences of legalization in the state of Colorado. California Family Council agrees with Mr. Morrissey’s assessment and subsequently strongly urges California voters to reject Proposition 64 on November 8. Editor’s Note: The full text of the letter can also be read below.